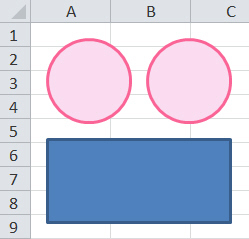 You can use Visual Basic within Excel, PowerPoint or Word to draw shapes, format them and even assign macros to run - this long blog gives lots of ideas of how to proceed! This is one small part of our free online Excel VBA tutorial. To find out how to learn in a more structured way, have a look at our training courses in VBA. There are two main ways to work with a number of shapes at the same time: by using the ShapeRange object, or by looping over a collection of shapes. Most Microsoft examples use the first method (the ShapeRange object); I find the second much easier to work with, however. Examples of both are shown below. We want to colour these circles pink, and give them a red border. Commands beginning with Selection don't support Intellisense. Because of the above limitation, it's easier to create an intermediate ShapeRange variable and use this to refer to a set of shapes. I accept that the above code probably runs more slowly, but you would have to have a serious number of shapes on a worksheet for this to matter! We'll write code to colour the ovals, but not the rectangle. 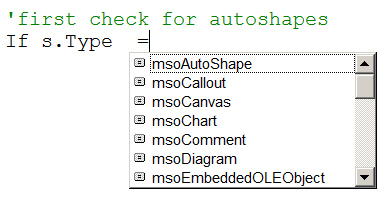 'now check this autoshape is a "circle"
Although this blog has concerned itself almost exclusively with autoshapes, there are lots of other shapes that you can add! Just some of the other shape types that you can add to a workbook! Having spent all of this time looking at how to create shapes, let's now take a quick look at how to assign macros to them.